Editor’s note: Conspiracy theorists, start your engines. Just a few days after we noticed AT&T’s switch to make its smartphone customers pay $45 a month for a 4 GB data plan AT&T announced a further change that would mirror Verizon’s plan and now require a $50, 5 GB plan to use that mobile hotspot feature on your phone. All the analysis from the original post below still holds. More on this topic soon. I haven’t paid attention to the AT&T 4G LTE site for a few months, so I was surprised by a new twist in AT&T’s top-network data plans. 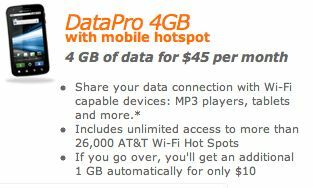 If you want to use the snazzy portable Wi-Fi hotspot feature found in almost every new top of the line smartphone, you’ll have to throw down on the “DataPro 4GB” plan, a $45 per month data plan which includes 4 GB of downloadable data and access to the hotspot feature. Don’t want to buy the big plan? Then you aren’t going to be able to use the hotspot feature, according to an AT&T rep I just had an online chat with. Will Intel Deal Bring Nokia Back to WiMax? There’s a lotta love between Intel and Nokia today, with promises for more-interesting mobile devices that combine the two companies’ singular strengths. But conspicuous by its absence was any mention of WiMax in the press release, perhaps because when it comes to Nokia WiMax is a bit of the red-headed stepchild. As followers of the U.S. WiMax market know, Nokia was one of the most aggressive backers of WiMax early on — its WiMax tablet for the then-Xohm network was ready last April, way before Sprint and then Clearwire could get their act together to actually offer services the Nokia device could access. By the time Xohm finally launched last year in Baltimore, the Nokia folks had soured so much on WiMax that they couldn’t even summon a single knowledgeable exec to talk about the tablet at last fall’s CTIA show in San Francisco. Not too surprisingly, soon thereafter Nokia ditched its WiMax tablet, started singing the praises of LTE and started calling WiMax nasty names, a messy breakup if there ever was one. But is there still hope that Nokia will come back to the WiMax pack? Even after all the ugliness Nokia is still listed as a valued partner on Clearwire’s website, which is either some oops-forgot-to-update-the-website or a contractual thing that leaves the door open for Nokia to come back. If the new Intel partnership pushes Nokia back into the WiMax device business that’s good news for Clearwire and its customers, who don’t have too many devices to pick from right now. It’s worth watching, but for now all remains quiet on the Nokia WiMax front. 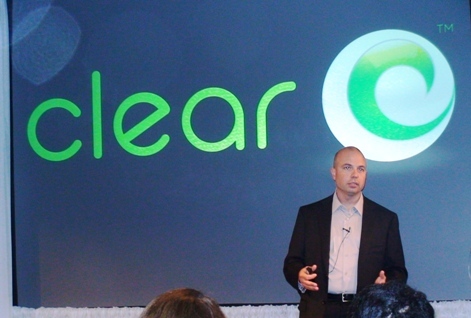 Good Report from the Clearwire Launch: Dailywireless was all over the event, with good descriptions of the demos and sharp photos (see if you can find Yankee Group’s Berge Ayvazian). Intel Investment in CLWR Goes South: We knew there was bound to be some economic fallout from the fact that the big investment in Clearwire was done at a valuation much much higher than where the stock is now. Stacey at GigaOM tells why the chip vendor and WiMax sugar daddy took a $1 billion write-down today. No More Nokia WiMax Tablet? So says this report from Mobileburn, but no official word yet from Nokia (we’ve got some emails out, will update if/when we hear back). More Complaints about AT&T 3G: Not really WiMax news and not from today but a story worth following for those of us who wonder how AT&T is fitting all those iPhone users into its spectrum.